Description: How do we determine if we are a healthy and growing Christian? How do we determine if our church is "healthy"? Some would point to external factors; size, attendance, programs, growth - others might look at the past and determine progress made - but do those really reveal health? For years we determined a person's health by looking at their weight and height then finding on a chart how those two compared to the average. The only problem with that was that different people carry weight differently; what might be healthy for one person, might be different on another. So doctors and researchers began to factor in "body shape" to determine what was "healthy" because each person is unique. The same is true in the church and for individual Christ followers; we are all unique and different - with different gifts and talents and different "calls" on our lives. So like an individual, one of the ways we can determine our "spiritual health" is by looking at our SHAPE. Join us as we examine Romans 12:3-8 and discover how each one of us is uniquely SHAPED for ministry and service and how our SHAPE determines the direction and health of our church. How do we determine if we are a healthy and growing Christian? How do we determine if our church is "healthy"? Some would point to external factors; size, attendance, programs, growth - others might look at the past and determine progress made - but do those really reveal health? For years we determined a person's health by looking at their weight and height then finding on a chart how those two compared to the average. The only problem with that was that different people carry weight differently; what might be healthy for one person, might be different on another. So doctors and researchers began to factor in "body shape" to determine what was "healthy" because each person is unique. The same is true in the church and for individual Christ followers; we are all unique and different - with different gifts and talents and different "calls" on our lives. So like an individual, one of the ways we can determine our "spiritual health" is by looking at our SHAPE. 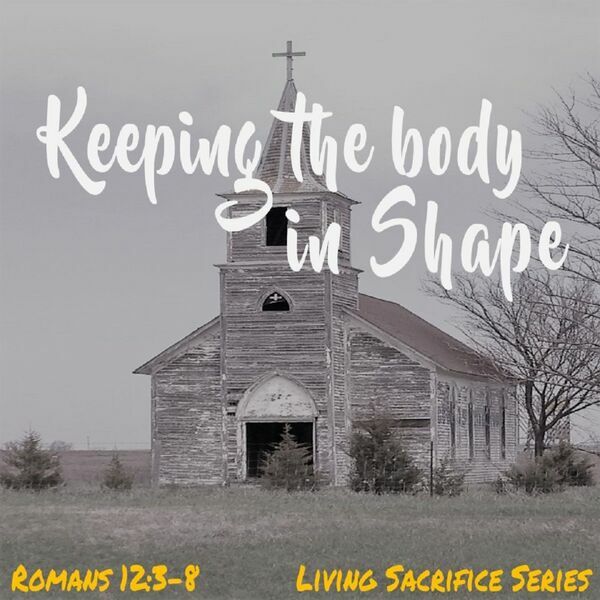 Join us as we examine Romans 12:3-8 and discover how each one of us is uniquely SHAPED for ministry and service and how our SHAPE determines the direction and health of our church.